The on-trend twosome – made up of Peter himself and Christopher de Vos – have garnered a cult-following for their quirky and contemporary digital prints which have been snapped on many a fashion-forward celeb. Embracing the change from Somerset House to the Brewer Streer Car Park in Soho, the show was held in the official British Fashion Council showspace on the 3rd floor of the building. Not content with the minimalist and white backdrop, the boys transformed the area by shunning the usual set-up and creating a loop-around catwalk with primary coloured netting which the audience and models snaked around. Pretty genius if we’re honest. Oh, the clothes! It was a shoulder-off at Peter Pilotto with models parading down the catwalk showing off theirs in the new Spring collection. While the designer duo may have found the perfect shade of baby blue (at long last) and perfected the ice cream colour spectrum, we’re kind of in love with the slight utilitarian theme which ran throughout the collection. Another sure to be hit were the uber wide culottes which masqueraded as skirts throughout the show. The rest of the show embraced the geometric patterns that the Princes of Print have become renowned for all while keeping it ultra feminine and romantic with tiers, mermaid ruffled lace and smocking done the Peter Pilotto way. There were of course, a few fun extras: an unexpected colour pairing here, a bright belt there and some sliders which were probably a godsend for the models. With makeup by MAC and hair by L’Oreal, this show was bound to be a beautiful one and not just because of the on point clothes. The hair was kept to a super smooth but not overly perfect middle-parting while models had fresh and almost bare faces which was made using MAC’s Waterweight Foundation. We’ll be recreating this look at home come Spring. The celeb-packed FROW was suitably PP clad with Susie Lau rocking a coat from the brand and Yasmin and Amber Le Bon opting for cute dresses from the previous season. 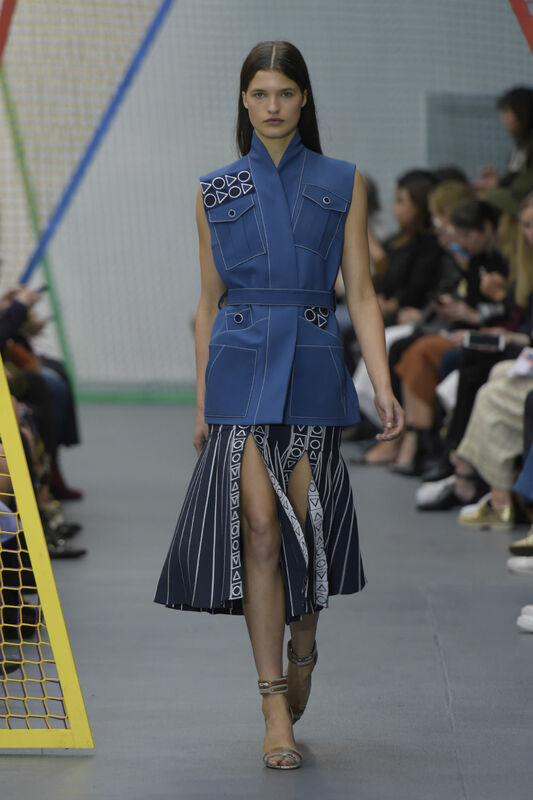 Like many of the brands this season, Peter Pilotto has gone all techno on us and live streamed it’s show on the LFW website and through Snapchat so those sat at home (or the office) could be a FROW-er too. Marie Claire will be Periscoping shows throughout the season so keep your eyes peeled on our Twitter feed for more details.